Hi everybody! 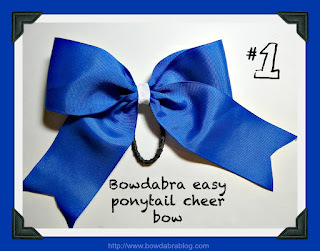 I'm over at Bowdabra blog today creating easy, fun cheer bows! Head on over so you can follow along with the easy tutorial. And while you are there be sure to check out the hundreds of free craft tutorials, videos and recipes! I know you’re not thinking too much about fall and football games while still in the heat of summer but it won’t be too long before you will be dressing up that pony tail with a cheer bow. You can make your cheer bow in any combination of colors to show your team spirit. And what’s more, you create the entire bow including the hair elastic in the Bowdabra! Leave it plain as a beautiful big bow to highlight your team colors or go one step further and glue on a charm, foam letters or rhinestone to the front to personalize it even more. This is a super kid’s craft too! These pony tail bows are so quick you will want to make cheer bows for the whole cheer squad!